You wouldn’t think that WhatsApp and Apple’s laptop Macbook Pro would be particularly good buddies–the app was born on smartphones, after all–but we’ve got a series of tips and tricks that will help you get the popular messaging app up and running on your laptop. All you’ll need to bring to the table is your Macbook Pro, your phone, and your web browser of choice–be it Google Chrome, Mozilla Firefox, or even Apple Safari. Appamatix will take care of the rest! Among those mobile messaging services that’s remained at the pinnacle of the pile, WhatsApp remains one of the most popular. If you’ve never used it before, picture it like this: it’s a standalone replacement for the text messaging service that came with your smartphone, replacing all of your messaging functions with one comprehensive (and free) application. It has the same sort of minimalistic, unintrusive design as an app that’s built into your phone, and it capitalizes on the information already stored in your contacts list in order to let you know who among your friends is using WhatsApp. It’s a bit odd, but one of the ways that WhatsApp manages to stand out against its competition is the flash and flair that make other apps popular. Snapchat is a good messaging app in its own right, but it’s dominated by the social media (emphasis on the media) features that it was built upon, and the same goes for Instagram and Facebook Messenger. The appeal of WhatsApp, then, is the fact that it’s a pure messaging app. Communication is its forte, and it helps you to carry it out more easily and directly than most other apps. Text messaging is a given, but WhatsApp also allows you to send audio and video messages, as well as make audio calls to anyone else on your contacts list. Better yet, we have solid proof that video calling is on the way, which will bring WhatsApp right up to the front lines in terms of how well it can compete with other messengers out there. If the feature performs as well as everyone’s expecting it to, WhatsApp will be able to give FaceTime a run for its money. However, all of that leads us to accessibility and cross-platform support, something that remains a less-used feature of WhatsApp. Even though it’s remarkably easy to get to, many aren’t sure of how to access it. That’s where our guide’s going to jump in. Though we’re going to focus on how you can bring WhatsApp to your Macbook Pro, know that the following steps can help you no matter what type of computer you’re using. Laptop or desktop, Mac or Windows; all of them use the same method! The first thing you should know about WhatsApp Web is that you don’t need to install any additional software to use it. As I said at the beginning of this guide, all that you’re going to need is your smartphone, your Macbook, and your web browser. Your smartphone comes into play because of how dependent WhatsApp is on the platform it’s meant to run natively on. In this case, Android and iOS devices are the leading operating systems that people are using WhatsApp on, but it’s actually supported by several others. Regardless of which one you happen to use, know that you’ll need to keep your smartphone handy while using WhatsApp Web. The process itself is very simple and doesn’t require you to install any excess software on your computer. This makes it one of the most lightweight messaging options that you’ll be able to find on a laptop or desktop computer. 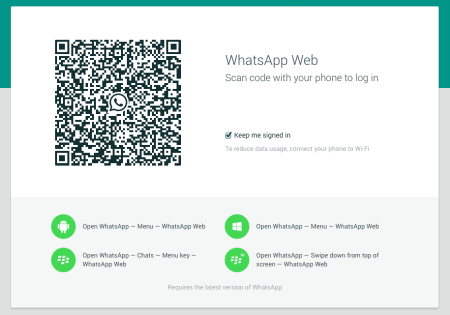 From within your web browser, head to the WhatsApp Web portal via this link. You’ll know that everything is working if you’re confronted by a great big QR code in the middle of your browser tab. Next, open WhatsApp on your smartphone. From the different menus, select “Settings” and then “WhatsApp Web.” You’ll probably have to give the app permission to use your phone’s camera (if you haven’t already), but it should activate the viewfinder. Line it up with the QR code in your web browser and…you’re done! WhatsApp and WhatsApp web will give you notification that the two are synced, and as long as you keep your smartphone close by, you’ll have access to all of the app’s services from the comfort of your Macbook Pro (or any other computer or operating system that you choose to use.) If that wasn’t simpler than having to hunt down a program, download it, install it, and sync it with an account or profile, then we need to compare it to some of the more convoluted methods that other messengers use to give you computer access. Of course, your smartphone does need to remain tethered to the web app if you want to keep using it, but since most of us aren’t more than a couple of feet away from our phones at any time, anyway, there’s a good chance that this won’t be a particularly difficult barrier to entry. Of course, just because it’s remarkably easy doesn’t mean there aren’t a few caveats and helpful tips you can make yourself aware of, in the interest of having an even better time with WhatsApp. First and foremost, you’ll want to have your phone connected to local Wi-Fi if you’re going to be using WhatsApp Web for any extended amount of time. Synced up apps can eat data like popcorn, and that can result in them taking a great big bite of your monthly data allowance unless you have a reliable internet connection. The good news is, you’re probably on Wi-Fi anyway if you’re using a Macbook Pro. Secondly, it’s important to realize that WhatsApp Web isn’t a substitute for WhatsApp on your smartphone. It’s crazy kinds of handy, for sure, but all of your contact management and chat history is staying primarily on your mobile device. When you sync it up with your web browser, the only thing that’s happening is your browser “reading” what’s on your phone. Appamatix has written articles about other messaging services, some of which have their own desktop apps and some of which require emulators. When you’re installing corresponding software on your machine, you’re usually a little more free to treat your computer as the hub for your messaging experience. Since that’s not the case with WhatsApp, keep those phones close! Of course, it might be the case that WhatsApp Web’s method of bringing the messaging experience to your Macbook Pro doesn’t appeal to you. Maybe you want something that works across multiple platforms but doesn’t require you to tether your phone. If that’s the case, we have a few more recommendations for you to check out. While these apps differ from WhatsApp in significant ways, they’re also at the peak of the messaging crowd. The messaging app that I use most often is definitely Facebook Messenger, and it’s not only because of its cross-platform accessibility. I like Messenger because of its features, among which are audio and video messaging, audio and video calling, and finally, reliable integration with the Facebook social media feed. It requires me to be in contact with someone on Facebook in order to use it, but let’s be real–most of the people that I send messages to regularly are on Facebook, and I’m already “friends” with them. It’s free, it’s fast, and it doesn’t require you to tether your smartphone; only sign in with your Facebook account. Additionally, the interface is just about as sleek as WhatsApp’s. WeChat is a messaging app that’s increasing in popularity, especially on the global scale. It has the same functionality as WhatsApp but features a little more flare (as well as a little more willingness to host third-party advertising.) Its web portal is almost exactly the same as WhatsApp’s, so if you’re looking for a similar experience within a different app, you’re likely to find it here. As this platform grows, expect it to incorporate more of the features that make its competition so popular. There are other apps out there, of course, but if you’re a WhatsApp user that wants to bridge their experience to a Macbook Pro, our handy little guide should see it done in a cinch. There’s a reason that WhatsApp remains as popular as it is, and even though it may lack some of the additional flash and features that make trendy apps like Snapchat and Instagram popular, it makes up for that with its “pure messenger” form. If you want a messaging app that knows what it is and embraces that specific functionality, then you’re on the right platform. Of course, if you have any additional questions or comments, leave them below, as usual! If you found this guide helpful, don’t hesitate to share it on Twitter or Facebook! Your Macbook Pro (and your web browser, whether you’re using Chrome or something else) should now be a happy host to your WhatsApp experience.